The Audiovox AVDBR1 is Slot load automotive Blu-ray player. It comes with main specs such as HDMI out, IR remote control, plays standard DVDs and audio CDs, USB input for thumb drives (up to 32 GB), and WiFi capable to enable BD live features. For owner of this Blu-ray, don't forget to download the manual because provide important information for example about installation, setup and torubleshootin guide. 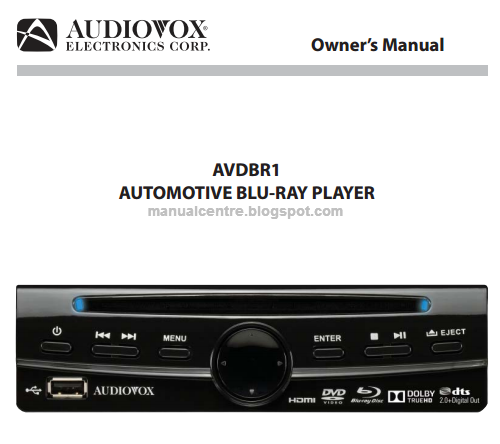 The Audiovox AVDBR1 Owner's Manual consist of 36 pages. Its' available in PDF format and support for english language. The manual contains information such as features, Accessories, Installing the Player, Connecting the External Remote IR Receiver, Using the Remote Control, Battery Replacement, Basic Playback (Blu-Ray Disc or DVD), General Setting Menu, Audio Setting Menu, Blu-Ray Region Codes, Compatible Formats, specifications and troubleshooting problem.